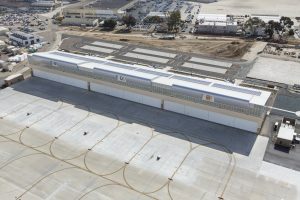 The P-750 Helicopter Maintenance Hanger was built to house and maintain the state-of-the-art combat ready helicopters stationed at the historic North Island Naval Air Station. 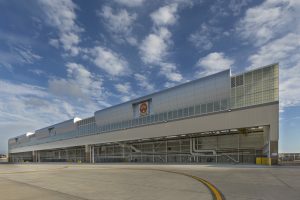 CMF procured, designed and installed the entire skin of the hangar which included metal roofing, ACM panels, and insulated metal siding. Expansion joint systems and Kalwall translucent wall panels completed the scope. The facility measures 631 feet wide by 151 feet deep and is over 65 feet tall. 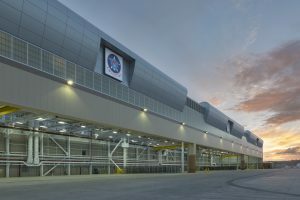 CMF installed 13,000 square feet of ACM panels by Universe. 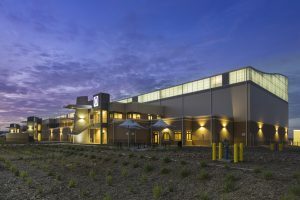 Twenty thousand square feet of 3-inch depth Kingspan 300R insulated panels were installed around the perimeter of the facility. Morin SLR-16 roofing panels were installed on an open truss roof. A Kalwall 2-3/4" thick translucent wall panel system was installed to provide the interior with natural daylighting.